It’s been just more than a century since the birth of Indian cinema and we are still not done celebrating ‘hundred years cinema in India’. Exactly 101 years back, on 3rd May 1913, what we consider the first ever full – length feature of India hit the screens. Father of Indian Cinema, Dadasaheb Phalke, publicly premiered his first feature film, Raja Harischandra on this day at Coronation Cinema, Mumbai. Although a private screening of the movie happened on the 21st of April, 1913, for select audience that included famous personalities and editors of many newspapers, this day is considered as the birth of Indian Film Industry. 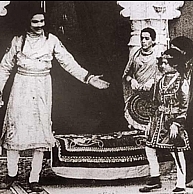 Raja Harischandra was a silent feature, starring Dattatraya Damodar Dabke in the title role and another male theatre artiste, Anna Salunke played Taramati, Harischandra’s wife. Phalke’s son, Bhalachandra D. Phalke played the son of Harischandra. Trymbak Telang was the cinematographer for this historic project. Since that proud day, from a soundless era to the age of photorealistic motion capture Indian cinema has evolved big time. Let’s celebrate the occasion with a toast to the man, who began the journey for us, Dadasaheb Phalke and for a more innovative and inspiring future. Long live Indian cinema! People looking for online information on Happy birthday Indian cinema, Raja Harishchandra will find this news story useful.